Comments Attraction is the strongest towards anything that has an extraordinary aura or a mystique about it. The unknown secrets, the undeciphered clues lend it a pull like no other. 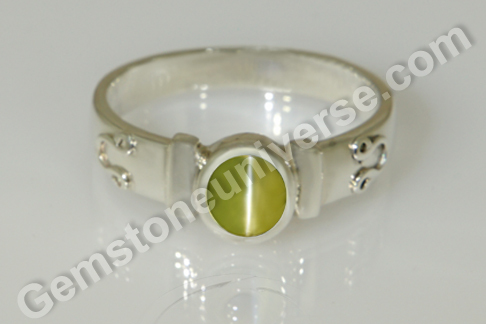 Featured today is a natural chrysoberyl cat’s eye from Srilanka, of 2.26 carats set in sterling silver as a Ketu talisman ring. Note that the symbol of Ketu stands in relief on the shanks. The Neptune green gem has been fashioned as a round cabochon that helps in exhibiting the superb sharp chatoyancy across the gem. Chrysoberyl cats eye also known as lehsunia or vaidurya in Hindi, is the gem of planet Ketu or the South node of the Moon. Ketu, just like Rahu is a node or point on the moon. Mythically Ketu represents the tail of the serpent. Since it is a point on the moon, the major planetary period or sub period of Ketu can have a negative impact on the mind (moon is the significator of mind and emotions) be very trying mentally. This also holds true in case of certain positions of Ketu in the birth chart. 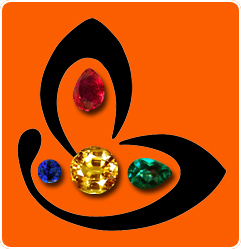 However, chrysoberyl cat’s eye is a strong and fast acting gem and it should be worn only after getting proper gemstone recommendation based on individuals birth chart. Planetary gem therapy gives tremendous boost to ones fortunes as well as mental respite if done properly.